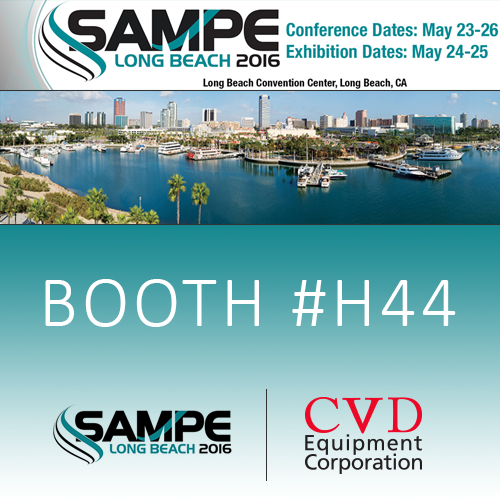 CVD Equipment Corporation, Booth #H44, cordially invites you to attend the exhibit held in conjunction with the Society for the Advancement of Materials and Process Engineering (SAMPE) Long Beach 2016 conference this May in Long Beach, CA. This conference and exhibition aims to advance materials and processes. Domestic and international buyers, manufacturers and suppliers - spanning industries including Aerospace, Marine, Wind Energy, and Medical attend every year. Visit CVD Booth #H44 where we can discuss our range of chemical vapor deposition equipment and services. Talk to our application engineers about your deposition requirements. CVD Equipment Corporation is a leading chemical vapor deposition technology provider, with 33+ years in designing and manufacturing industrial coatings systems. CVD develops advanced material handling and automation for coating fibers, 3D shaped parts, porous structures, wafers, foils, tapes, etc. Coatings perform functions including corrosion resistance, antifouling, wear resistance, etc.